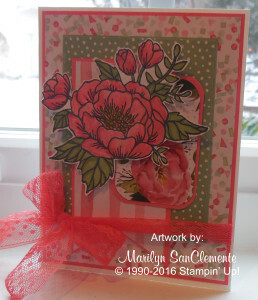 Marilyn SanClemente January 15, 2016 January 15, 2016 All Occasion Card, All Occasion cards, Anniversary Card, Birthday, Blendabilities Markers, Handmade cards, Occasions catalog, Stampin' Up! Today I have a group of cards that I made using the new Stampin’ Up! 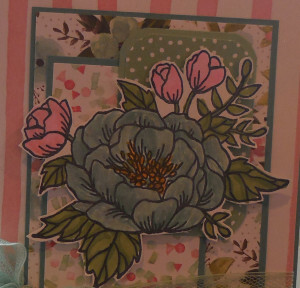 Birthday Blooms stamp set and the Birthday Bouquet Designer paper. So the story behind this card; one of my friends brought over a picture of a card that she found on Pinterest. She asked me how to coordinate cardstock to make a similar card. So I drew out this sketch and figured out the dimensions. Then I decided that I needed to play with this sketch and made a few different variations using a couple of different designer papers and stamp sets. One of the things that I love about Stampin’ Up! is that a package of Designer paper has 12 designs made with colors that all coordinate. So it is very easy to design a card and mix and match the colors. Two of these cards are made with the Birthday Bouquet designer paper. If you look on the back of each set of designer paper the colors that are in the designer paper are listed. So the first card, I used whisper white for the background, Calypso coral to layer the designer paper and mint macaroon to layer the polka dot background. Next is a banner cut to 2″ x 4″ layered on a piece of Calypso Coral that is 2 1/8″ x 4 1/8. The last layer is a piece of the flowered pattern cut to 2 1/2″ x 1 5/8″. I used the corner rounder on this piece and layered it onto a piece of Calypso Coral Cardstock that has been cut to 2 5/8″ x 1 3/4″ with the corner also rounded. After assembling th e layers, I used a piece of the Watermelon Wonder lace to tie around all the layers. This is then attached to a 5 1/2″ x 8 1/2″ piece of Whisper White cardstock scored at 4 1/4″ to form the card base. I used the new Wink of Stella Glitter Brush (141897) from the Occasions catalog to add glitter to the flowers. It is very hard to see the glitter on the pictures but it beautiful! 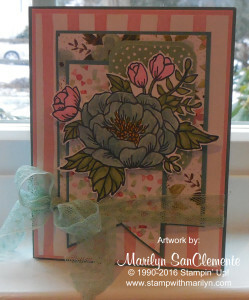 The card with the blue flower is made with the same Birthday Bouquet designer paper and Birthday Blooms stamp set but with Lost Lagoon color for the layers and the mint macaroon lace ribbon. 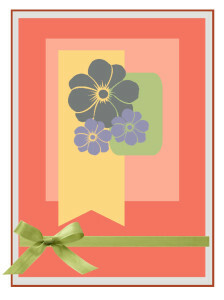 The third card is made with the Love Blossoms designer paper and layered using Rose Red cardstock. The stamp set is the Sale-a-bration set What I love.